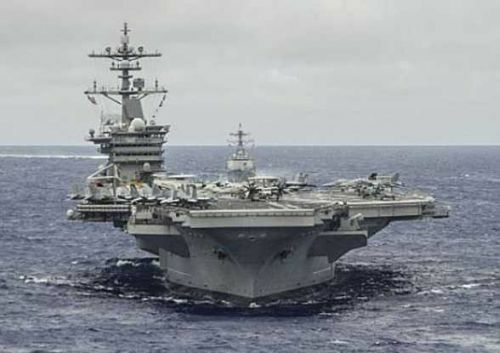 The Navy aircraft carrier USS Carl Vinson is now taking over station in the Persian Gulf, ready to harrass the Islamic State terrorists. The San Diego-based Vinson is accompanied in the region by the guided-missile cruiser USS Bunker Hill and the guided-missile destroyers USS Gridley, USS Sterett and USS Dewey. The entire strike group left home Aug 22. with about 6,200 sailors for its scheduled deployment to the Western Pacific and the Middle East. The Makin Island amphibious ready group, which relieved the Bataan group in September, is also in the region supporting Operation Inherent Resolve. The USS Makin Island is a Wasp-class amphibious assault ship, able to deploy a Marine combat force. The group brings with it a variety of aircraft: MV-22B Ospreys, AV-8B Harriers, CH-53E Super Stallions, AH-1Z Super Cobras and UH-1Y Hueys.